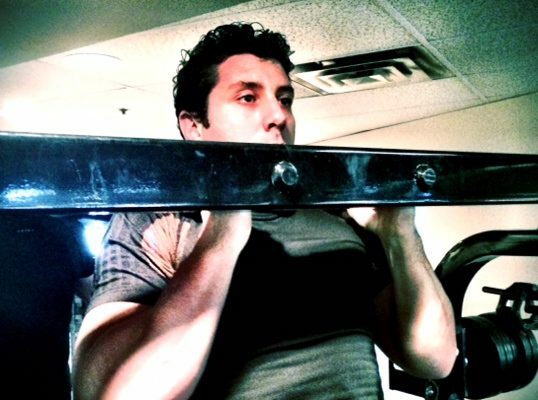 This is #Rep1 trainer, Gui, performing a lunge with a pec fly. If you are a gym rat and have been for the past decade, you’ve noticed a change in the gym. People have been starting to use this weird roller and grimacing while sitting on it. You are probably aware of the name of this practice: foam rolling or self myo-fascial release (SMR). But why are people doing it if it hurts so much? Foam rolling, or SMR, is a fancy term for self massage to release muscle tightness or trigger points. It can be performed with rollers, Theracane, trigger point balls or even your bare hands. Trigger points are “knots” (a bunch of overactive muscle fibres) that can be found in the muscle. It is very easy to find them: they hurt under pressure. A common example is the tenderness you feel when you put pressure on some specific area of your IT band (side of your thigh). WHY SHOULD YOU SPEND TIME ON THE ROLLER? 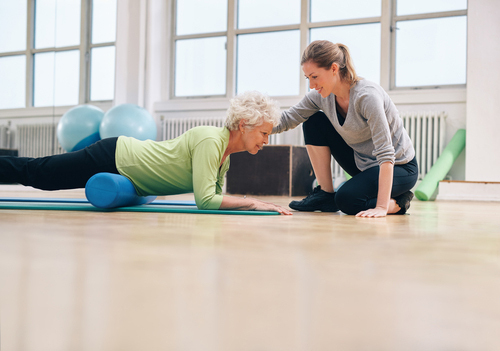 foam rolling can assist in releasing trigger points and breaking up adhesions and scar tissue. foam rolling increases the blood flow in the muscle. foam rolling forces the muscle to relax. It stops the overactive muscle from starting the movement and allowing the under-firing muscle to work properly. This gives you a short window of time where you can teach your body a proper movement pattern. As you probably guessed, this is my favourite reason. An example would be the client that performs push-ups with a shoulder shrug: chances are the upper trapezius are overactive, and start before the rhomboids can kick in, releasing the upper traps with SMR and stretching allow you to perform a proper push up (article coming soon). I like to use rolling as a compliment to stretching. Imagine an elastic band with a knot in the middle, if you pull on it, the elastic stretches but the knot doesn’t. Foam rolling allows you to “untie” the knot before stretching, making your stretching session more efficient. Make sure not to roll the same body part every day: you will be rolling your muscle/tendon to a pulp, creating dysfunction, and increasing the chances of injury. find a tender spot and hold for a while (usually 30 seconds). You want to hold the tender spot until the pain disappears. I don’t like to give a number because it adds tension/stress to a practice that is designed to actually relax you. I like to tell my clients to breathe deeply while rolling, inhale through the nose, and exhaling completely through the mouth. This helps with the relaxation. The more relaxed you are, the quicker the pain will go. find a tender spot, and then stretch/contract the muscle. This is a more “aggressive” technique. Yes, it is my pick! One example of this method is rolling your quads (front of the thigh), then curling the leg as you would do in a hamstring curl 3 times. roll out different muscle groups, and make sure you don’t always do the same spot. There is nothing more impressive in a gym than a person who can rip off perfect chin ups and make it look easy. If you have spent time in a fitness facility it is something we have all struggled with at one point. The jealousy of someone who can have great form and do over 10 chin ups is something we have all known. How did that guy, or girl, make doing chin ups look so easy?? How do I do that myself? Why should I do that? Well, here’s your explanation and here’s your plan. Stick to this program and not only see your strength go up but your waistline go down! -Chin ups are a compound exercise: more than one joint is moving and therefore it uses lots of muscles… which equals more bang for your buck! This exercise targets the latissimus dorsi muscles of your back, but also involves a number of muscles in your arms, shoulders and chest, including your posterior deltoids, triceps, biceps and lower and middle trapezius. -They are extremely convenient and are one of the most simple (but hard) exercises to do. You also reach your max very quickly, meaning they can be used in a superset and allow you to save time. -Fat loss: Lots of muscles involved does mean that you will burn more calories in a shorter amount of time: they increase your basal metabolic rate (you burn even more fat even when you are sleeping). Grab a straight bar, get your feet off the floor, and lift yourself up. Don’t over think it, just do it! Test yourself at the end of the week 6, and VOILA you should now be able to do 10 chin ups. What if you can’t do 3 chin ups? the easiest one, make sure to train the grip that you will be using for the chin up. Do 5 sets of 5 reps with the maximum weight you can use with proper form. use a chair, a bench or jump to the top position, hold for 10 seconds, rest for 90 seconds then repeat 5 times. I personally like this exercise better than the negative pull ups. So you can do 10 chin ups, now what? Lift yourself up, then lower yourself halfway down, and repeat 7 times. After the 7th rep, lower yourself all the way down and lift yourself halfway up, repeat 7 times. When you finish the seventh rep, you do 7 full range-of-motion chins. I don’t think there is anything special about the number 7, it is probably just gym tradition, but it burns so it must be good! Who will be the first person doing a set of 21 and sending us a video as proof? The first person to do so will get a high 5 from me, and a huge amount of respect from the Rep1 team! This has been an amazing summer for my kids, not only has the weather been fantastic for them to be outside all day but my daughter has learned to ride her bike. My daughter, “Kitty” watches her brother, “Jackson”, get on his bike everyday and rip around. She is so envious of him. I tried to teach her to ride but it usually ended in some form of an argument. We decided to put her in bike camp to teach her how to ride properly. After her first day at camp, I went to pick her up all I could see what this huge smile across her face. She was so excited that she could ride her bike and could keep up with her brother!! Everyday I get home from work now we are out riding!! How awesome is that… Look out here comes the future in bike racing. Click on the link below to see Kitty riding her bike.